Posted By Natalie on July 31st, 2012 at 1:22 pm | 172 comments. What a perfect way to wrap up derby season 2012! 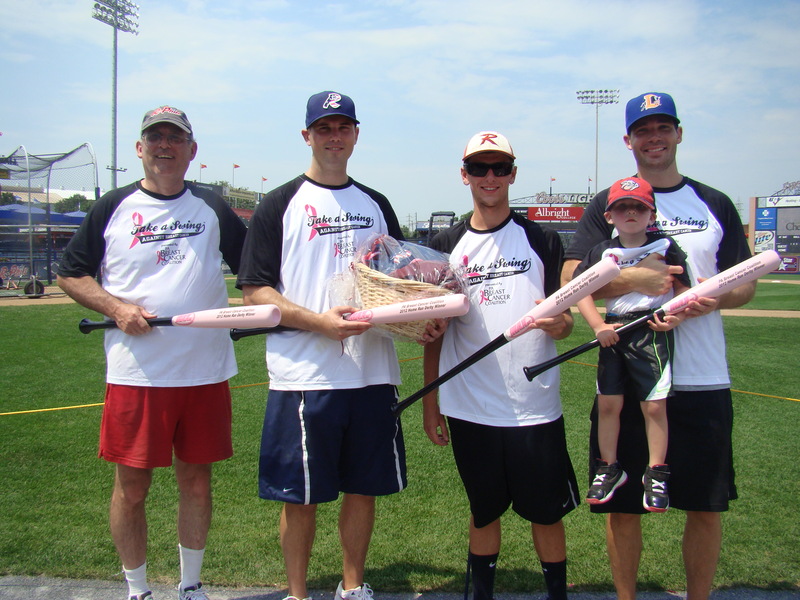 15 teams and 2 individual sluggers battled it out on the field for bragging rights and those coveted pink bats this past Saturday at the home of the Lancaster Barnstormers. After a rain-out earlier this month, our dedicated batters and volunteers showed their support yet again with an incredible turnout. In the end, “Guns of Roses Team 1” from the Lancaster Police Department secured the top spot with 1,560 points. 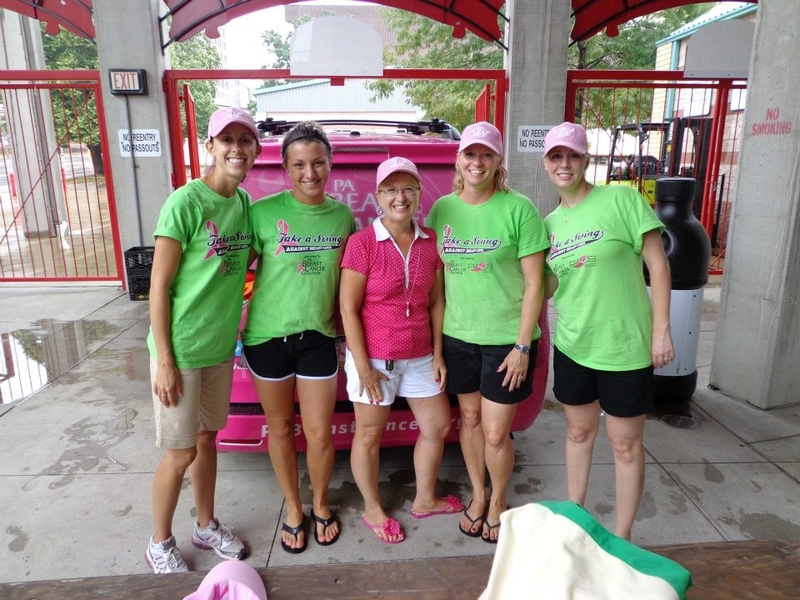 The group enters the derby each year to support their co-worker, Judy, a breast cancer survivor of two years. The day’s highest individual score went to Greg Gunter of Team UTI who smashed two homers over the Clipper Magazine Stadium fence and racked up 535 points! Congratulations to our home run hitter! Thank you to the awesome staff and crew at Clipper Magazine Stadium for making Derby #8 a success! You can check out all of the Lancaster Derby photos by clicking here. Don’t forget to stay up-to-date on PBCC news and events by following us on Twitter and Facebook! Did we have fun or what? Derby season would not have been complete without every one of our batters, volunteers and spectators! Thank you for all of your hard work and support as we fight to find a cure to this disease. We hope to see you again soon! Posted By Kristen on July 30th, 2012 at 10:26 am | 144 comments. On Wednesday, July 25, batters, fans and a plethora of volunteers came out to the Peoples Natural Gas Field, home of the Altoona Curve, to participate in the second-to-last home run derby of the season. 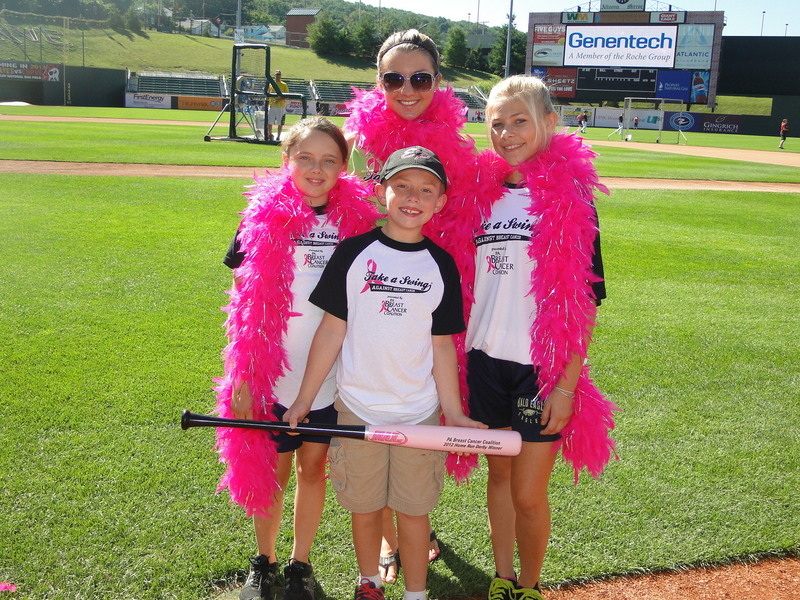 Take a Swing Against Breast Cancer® at the Altoona Curve started out with a group of “little sluggers” stepping up to the plate to take their turn at the batting cage. This group, comprised of 3 batters under the age of 15, knocked off the socks of spectators as they made some incredible hits to the outfield and truly held their ground. Look out for this group in the years to come at Altoona! Thanks to all of our teams, and the groups of volunteers who stayed with us throughout the day to shag balls in the outfield as the sun beat down on them…that’s dedication! 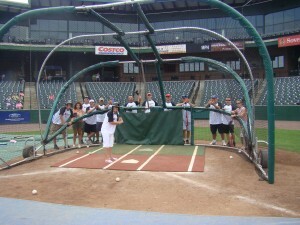 We had groups from AT&T, Best Buy, YTI Career Institute and the Altoona Curve Junior. We couldn’t have been there without you, thanks for your support! Check out the list of teams below, and our solo home run hitter! Thanks to everyone who came out, including the staff of the Altoona Curve for their help and enthusiasm at our event. 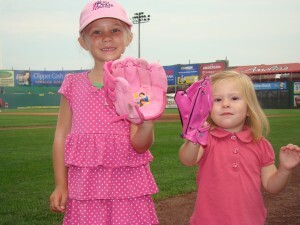 View all of the photos from the Altoona Derby at Peoples Natural Gas Field here. Posted By Kristen on July 26th, 2012 at 5:10 pm | 1814 comments. The sun was out as our teams, individual batters and an abundance of volunteers gathered on July 20th at the Washington Wild Things at Consol Energy Park. The 5th derby of the season kicked off with local Representatives Brandon Neuman and Robert Matzie going head to head to see which team would claim official bragging rights over the other. 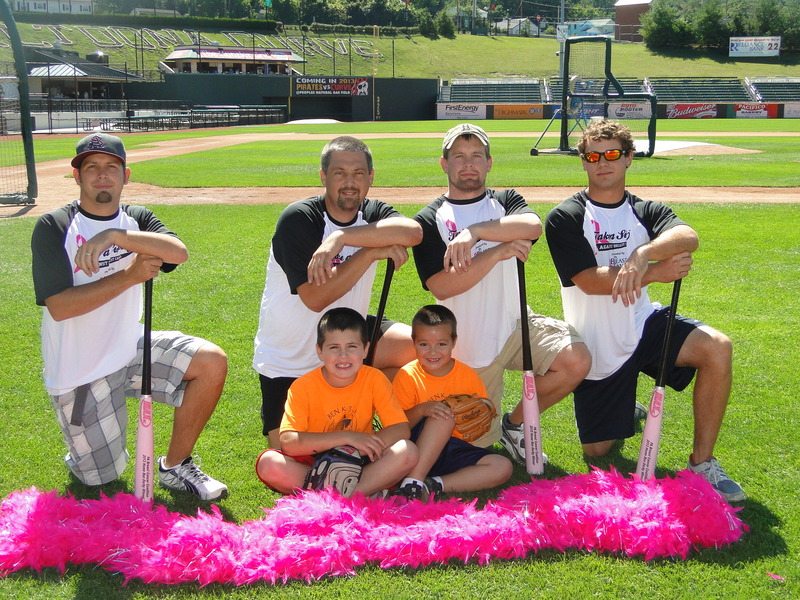 They decided that the losing team would have to wear the pink boa on the House floor in order to bring awareness to the Take a Swing Against Breast Cancer® competition. With the help of 8 home runs (7 coming from one batter alone! 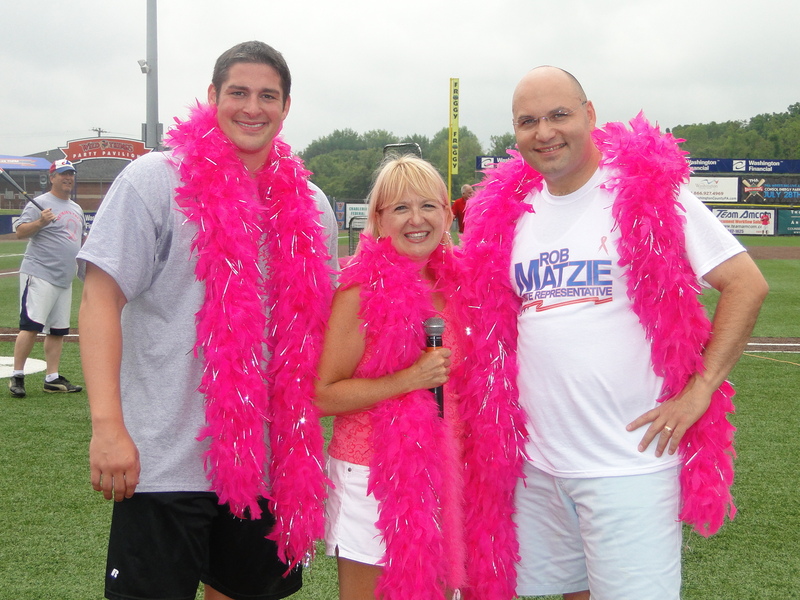 ), Neuman’s Crew won for the second consecutive year, and Rob Matzie will soon be seen publicly in the pink boa, all in the name of breast cancer awareness! Congratulations to batter Bill Klenoshek, who is currently our overall individual batter winner with 675 points and of course our 7-home-run-batter Joe Oliphant! Thank you to everyone who came out to the Washington Derby, and special thanks to the staff at Consol Energy Park for your support and entertainment throughout the day! 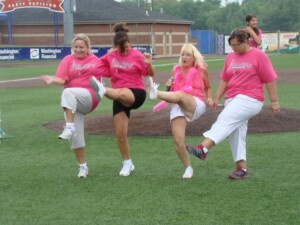 Our volunteers truly appreciated the dance music in between batters! Everyone that was there made this a very energetic, silly and successful event for the PBCC. View all the photos from our day at the ballpark here. Posted By Kristen on July 24th, 2012 at 10:08 pm | 643 comments. View all of the day’s photos at the Erie SeaWolves here. It was a fantastic day despite the weather as we raised awareness and funds for breast cancer survivors throughout the state. Special thanks to the great staff and management at the Erie SeaWolves, the PBCC staff loves their pink SeaWolves hats! 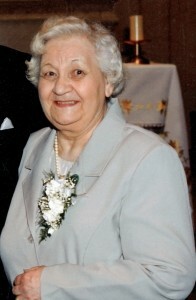 Check out coverage of the event on GoErie.com and stay tuned for our next blog update! 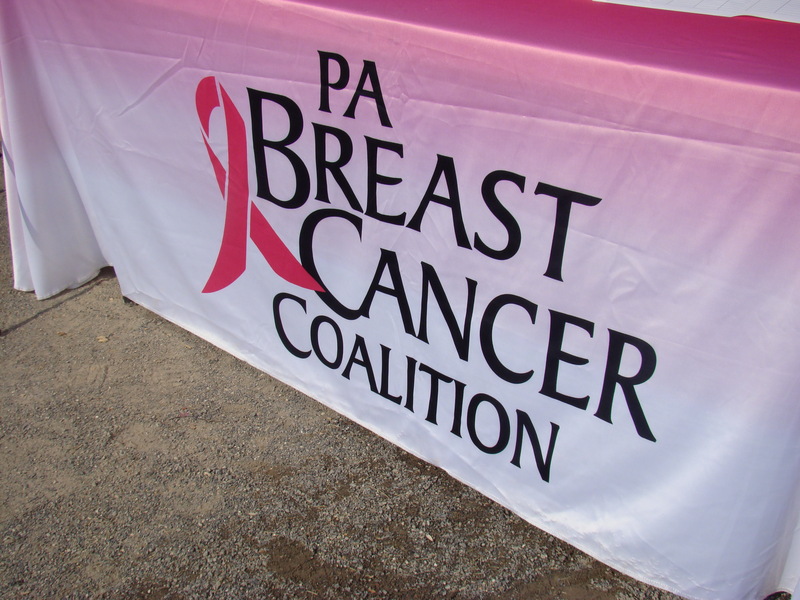 Don’t forget to follow us on Twitter (@PBCC) for live updates from each derby. Until next time! Posted By PA Breast Cancer Coalition on July 23rd, 2012 at 2:21 pm | 350 comments. Hello friends. It is with very mixed emotions that I write this today. After 18 memorable years with this remarkable organization, my time here is coming to an end. I have learned so much first as an intern…then as a fledgling part-time employee…then as Program Director…and finally as Executive Director. I am confident that nowhere else could I have gotten such a wide range of experience, or encountered so many amazing people. People like the ABCs support group…the Play it Again for Charity hockey fans…the Garden Spot Motorcycle Club members…Refunds for Research grant recipients…and the folks at Bill Martel Racing to name a few. People like the incomparable staff: Dolores, Tricia, Jen, Kim, Carol, Kristen, Natalie, Kevin, Sarah, Jessie, and the many interns who have worked with us over the years. You make it a joy to come to work every day. And I’ve never laughed as hard as I have with all of you. And people like Pat Halpin-Murphy. A more effective leader one will never find. She is a trailblazer, an innovator, and is never at a loss for how to better this organization. She taught me to never take “no” for an answer. She taught me the power of being positive. And she taught me that a hug can absolutely be transmitted through the phone lines. It has been an honor working for all of you, and I know that one day the cure to this disease will be found. And I know that the PBCC will be at the forefront. It’s where we belong. Posted By Kristen on July 18th, 2012 at 12:58 pm | 1672 comments. 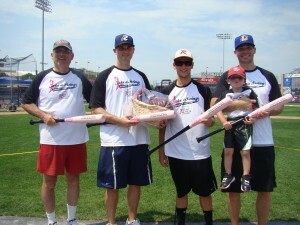 Temperatures were rising in Reading, but despite the heat, the First Energy Stadium was the setting of a record-breaking 21 home runs at our third home run derby of the season, including an incredible 8 individual home runs from John Furlong and 5 individual home runs from Kevin Becker. 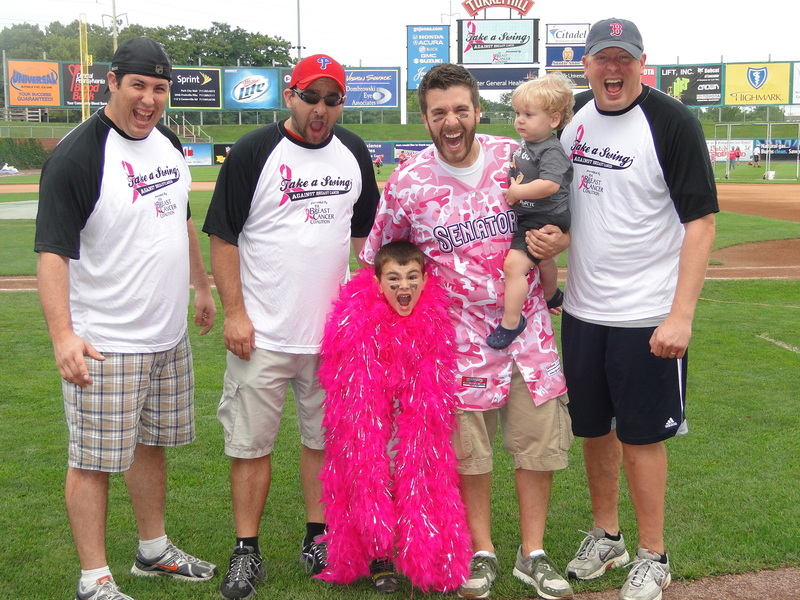 A total of 13 teams and 27 volunteers, along with 3 individual batters came out to the Reading Phillies to Take a Swing Against Breast Cancer® with the PA Breast Cancer Coalition. Special thanks to all of our batters & volunteers, as well as the energetic friends, family and coworkers who came out to cheer on the teams. Even Screwball came out to show his support for breast cancer awareness! Together, you made the day a huge success. Additional thanks to the incredible staff at the Reading Phillies for their help in putting this day together, and to our media partners of Blue Ridge Cable 11 news for covering the event. View all of the Reading photos here. Next stop: Erie SeaWolves on Thursday! Remember to follow us live on Twitter (@PBCC) for live coverage of all of our home run derby events. Posted By Amy on July 18th, 2012 at 9:59 am | 306 comments. I was 60 years old when I was diagnosed with breast cancer. I thought it couldn’t happen to me. That was 22 years ago. My doctor had scheduled a mammogram for me and that mammogram saved my life. I wouldn’t have known about the cancer until it was too late. Sometimes women tell me that they don’t want to have a mammogram because they’re afraid it will hurt. I tell them that one little hurt is going to save you a big one later on. 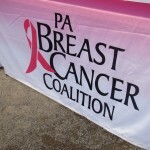 When I was first diagnosed, Pat Halpin-Murphy hadn’t created the PA Breast Cancer Coalition yet. But once it got started, the PBCC invited me to represent Carbon County in the traveling photo exhibit. I agreed right away. I’m always willing to help with anything. 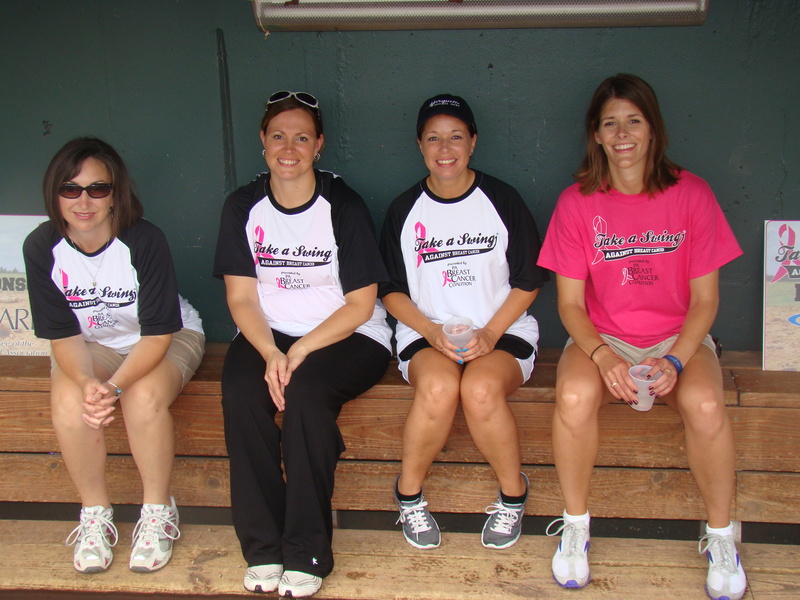 I know that Pat and the PBCC have been working tirelessly and will always keep going to help other women. Through surgery and radiation treatments, I had faith. And I kept my sense of humor and kept busy. That will get you through difficult times. I love to crochet and have made many bride dolls, and I wanted to do something special for the PBCC. So I made a pink doll and attached 67 roses to the train to represent the women in the 67 counties from the exhibit, and I added pink beads in memory of those we have lost. I was happy to be able to present the doll to Pat at the recent exhibit opening at the Hazelton Health & Wellness Center. Quite a few friends have asked me to make one for them but I won’t make another one like it. It’s one of a kind, just like Pat is. Over the years I’ve seen a lot of changes, like digital mammograms and other advances. I see many more women getting mammograms now and talking openly about their breast cancer. It’s really good to see that.